/status/dashboard The control panel to CAS server functionality and management. /status Monitor CAS status and other underlying components. /status/sso Describes if there exists an active SSO session for this request tied to this browser session. /status/swf Describes the current configured state of CAS webflow in JSON. /status/stats Visual representation of CAS statistics with graphs and charts, etc. /status/logging Monitor CAS logs in a streaming fashion and review the audit log. /status/config Visual representation of application properties and configuration. /status/ssosessions Reports active SSO sessions. Examine attributes, services and log users out. /status/services Reports the collection of applications registered with CAS. /status/trustedDevs Reports on the registered trusted devices/browsers. /status/authnEvents When enabled, reports on the events captured by CAS. /status/attrresolution Examine resolution of user attributes via CAS attribute resolution. /status/discovery Advertises the CAS server’s profile, features and capabilities for auto-configuration of client applications. /status/autoconfig Describes how the CAS application context is auto-configured. /status/beans Displays all CAS application context internal Spring beans. /status/configprops List of internal configuration properties. /status/dump Produces a thread dump for the running CAS server. /status/env Produces a collection of all application properties. /status/health Reports back general health status of the system, produced by various monitors. When the application is secure, a simple status when accessed over an unauthenticated connection is presented, or full message details when authenticated. /status/info CAS version information and other system traits. /status/metrics Runtime metrics and stats. /status/mappings Describes how requests are mapped and handled by CAS. /status/shutdown Shut down the application via a POST. Disabled by default. /status/restart Restart the application via a POST. Disabled by default. /status/refresh Refresh the application configuration via a POST to let components reload and recognize new values. 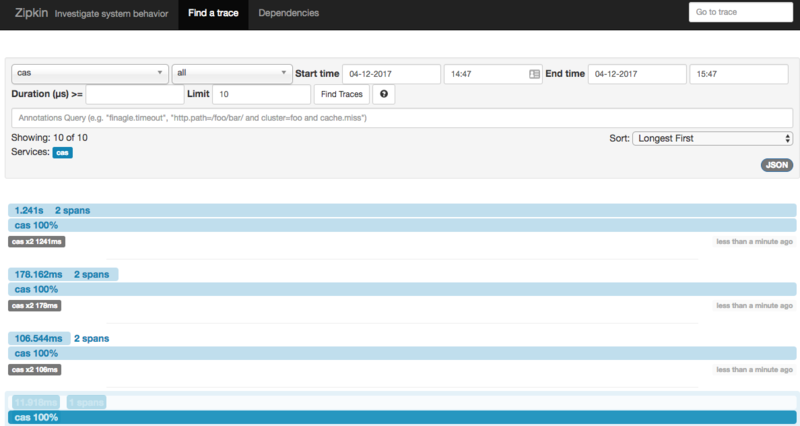 Actuator endpoints provided by Spring Boot can also be visually managed and monitored via the Spring Boot Administration Server. Note that /status endpoint is kept mostly as a legacy endpoint. If you wish to obtain health status of each monitor in detail, we recommend the /status/health endpoint instead. All urls that are scoped to the /status endpoint are modeled after Spring Boot’s own actuator endpoints and by default are considered sensitive. By default, no endpoint is enabled or allowed access. All endpoints may be globally considered sensitive. Spring Boot’s actuator endpoints may be individually marked as sensitive or enabled. Similarly, CAS endpoints may be individually marked as sensitive or enabled. In the event that access to an endpoint is allowed, (i.e endpoint is enabled and is not marked as sensitive), CAS will attempt to control access by enforcing rules via IP address matching, delegating to itself, etc. The /status endpoint is always protected by an IP pattern. The other administrative endpoints however can optionally be protected by the CAS server. Failing to secure these endpoints via a CAS instance will have CAS fallback onto the IP range. If you decide to protect other administrative endpoints via CAS itself, you will need to provide a reference to the list of authorized users in the CAS configuration. You may also enforce authorization rules via Service-based Access Strategy features of CAS. Allowing access to the /status endpoint via IP address matching needs to be very carefully designed, specially in cases where CAS is deployed behind a proxy such as Apache. Be sure to test access rules and policies carefully or otherwise devise your own. Alternatively, you may design the security of CAS /status endpoints to take advantage of Spring Security. After all, that’s what sensitive is designed to do. Using this model and via CAS settings, you get to define the authentication scheme (i.e. BASIC) as well as the protected/ignored paths and pre-defined “master” username/password that is used for authentication. If the password is left blank, a random password will be generated/printed in the logs by default. Besides the master credentials, backend authentication support via LDAP and JDBC storage facilities are also available. Monitors allow you to watch the internal state of a given CAS component. See this guide for more info. For most users Sleuth should be invisible, and all interactions with external systems should be instrumented automatically. Trace data is captured automatically and passed along to Zipkin, which helps gather timing data needed to troubleshoot latency problems. Metrics allow to gain insight into the running CAS software, and provide ways to measure the behavior of critical components. See this guide for more info.